IRS Form W-9. Eighteen Capital Group requires a completed IRS Form W-9 on file for all vendors. Please complete and submit a signed W-9 if this is the first time you are providing services to an Eighteen Capital Group property. Certificate of Insurance (COI) Form. Eighteen Capital Group requires a current General Liability and Worker’s Compensation Certificate of Insurance on file for all vendors providing on-site services to the Property (e.g. landscaping, repairs, maintenance, pool services, etc.). Please ensure you have submitted a current Certificate of Insurance to avoid payment processing delays. Please refer any questions regarding insurance requirements to your local insurance company.The Certificate of Insurance should have your correct legal Entity name as well as the name of the Property as Additional Insured. Upon completion of the W-9 and Certificate of Insurance (COI), please attached the documents and return. Vendor Setup Form. Included in the Vendor Agreement Package upon request. Contact our corporate office for a copy of our vendor agreement, which we will need signed and returned to us. Below is a overview of what that document will contain. The vendor shall maintain, at its sole cost and expense, such usual and customary types of insurance coverage as Eighteen Capital Group may require. 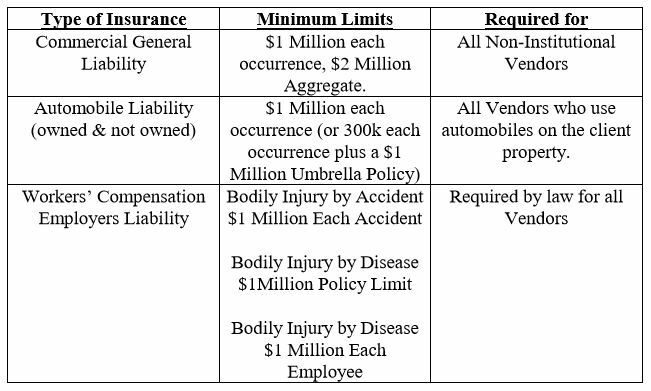 Such coverage shall be in the amounts stated in the section below entitled Minimum Coverage Amounts. Such insurance shall be provided whether or not required by the laws of the State wherein the work is to be performed. Vendor shall require its subcontractor(s) and suppliers to furnish the same coverage, limits of insurance and Additional Insured status as required of the vendor under The Vendor Agreement. Insurance policies are to be written by companies acceptable to Eighteen Capital Group, and licensed to do business under the laws of the state in which the work is to be performed. Such insurance companies shall have a Best’s rating of “A- VII” or better. All certificates are to contain the following statement: “The insurance coverage evidenced by this certificate shall not be cancelled nor materially altered except after thirty (30) days written notice has been provided and received by Eighteen Capital Group.” The insurance policies shall be endorsed to provide such notice. The vendor shall furnish satisfactory evidence to Eighteen Capital Group prior to the commencement of work that the vendor has complied with all of the above requirements and that the coverage, including the specific amounts required, is in practice. Eighteen Capital Group shall have the right, but not the obligation, to prohibit the vendor or any of their subcontractors from entering upon the property until after a certificate of insurance indicating full compliance with all requirements is received and approved by Eighteen Capital Group. Failure of Eighteen Capital Group to demand such certificate of insurance or failure of Eighteen Capital Group to identify a deficiency in such evidence shall not be construed as a waiver of Vendor’s obligation to purchase and maintain such insurance. WORK WILL NOT BE PERFORMED AT ANY EIGHTEEN CAPITAL GROUP PROPERTY WITHOUT AN APPROVED PURCHASE ORDER (PO) NUMBER. Please submit your invoice only once. If you email your invoice, please submit each invoice as a separate attachment. If you fax your invoice, please fax each invoice separately. Submitting invoices to Eighteen Capital Group corporate office will delay processing. Please do not submit a statement after submission of the invoice. Line release or waiver may be required from vendor, especially when processing final payments. Eighteen Capital Group processes invoices every business day in an effort to disburse payments as quickly as possible. Eighteen Capital Group utilizes a proprietary automated work flow system to process invoices for payment and has processes and controls in place to safeguard our assets and maintain an appropriate audit trail. These procedures include each vendor invoice going through multiple steps and approvals prior to disbursement. The length of this process can vary for each invoice depending upon numerous factors, the most important of which is the vendor providing all necessary and correct information and their product/service being satisfactory. In an effort to protect the interests of our properties, it is standard operating procedure for Eighteen Capital Group to initially refuse payment of any amounts they deem unreasonable fees. Payment Options – Eighteen Capital Group will submit payment to approved vendors with a traditional check by U.S. Mail. When and if electronic payment becomes available, we will advise you of this option.